BANGI, 1 Mac 2012 – The National University of Malaysia (UKM) will organise joint researches, academic programmes and other activities with Consumers International (CI) for the benefit of consumers. The cooperation also include attachments for academic members and students for internship, exchanges and use of facilities for such purposes as well as organising and co-hosting conferences and seminars and the publication of books and journals. A Memorandum of Understanding (MoU) was signed between UKM and CI today for the collaboration which will also explore new ways to strengthen their co-operation for the benefit of the consumers. The signing ceremony was held at the Council Room at the Chancellory here today in conjunction with the visit and public lecture given by CI Director General, Helen McCallum. 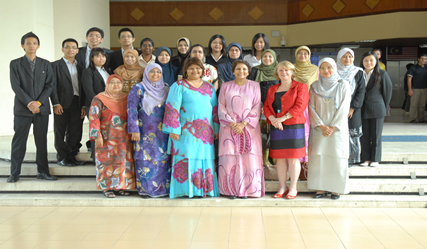 Deputy Vice-Chancellor (Industry and Community Partnership) UKM, Prof Dato’ Dr Saran Kaur Gill signed for UKM with the Dean of the Faculty of Law, Prof Dr Aishah Bidin as a witness while CI was represented by Helen with its Head for Asia Pacific and The Middle East, Dato’ Indrani Thuraisingham as the witness. Prof Saran said the MoU was an earnest effort by UKM to promote consumerism and lauded efforts by the Faculty of Law and the Arus Perdana Research Project headed by Asso Prof Dr Sakina Shaik Ahmad Yusoff who negotiated the terms for the MoU. Consumer International is the world federation of consumer groups with over 220 member organisations in 115 countries.